The delay() statement that we used so far for our timing stalls the Arduino. This leads to a complete lack of feedback when we change the cycle time while the cycle is running. 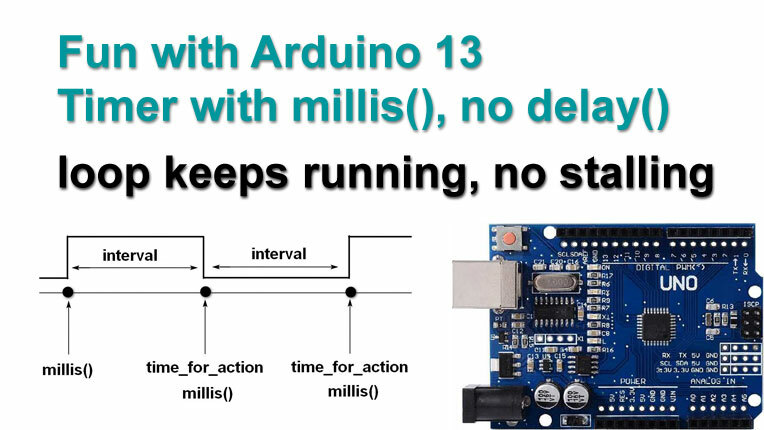 Luckily there is a solution: we can use the Arduino internal clock, which counts milliseconds from the moment the Arduino is started. We can read the clock using the millis() statement and we can decide if it is time for action. 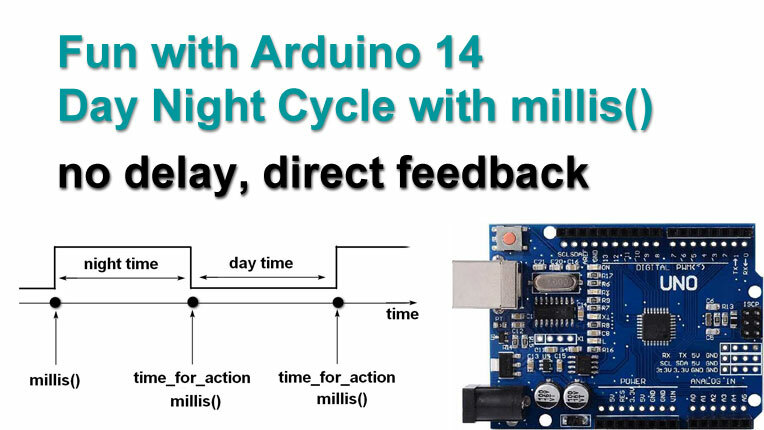 Now that we know how to get rid of the delay(0 and use millis() in stead (video 13) we can finalize our Automatic Day Night Light Cycle unit to have direct on screen feedback of cycle time adjustment by the user and to have the cycle stop, and the lights turn off, immediately when the switch is set to 'off'. We used analogRead() to read the voltage on our potentiometer. The Arduino also has the opposite instruction: analogWrite(). This name is somewhat misleading. Unlike with an analog input, where a 10 bit A/D converter is used, the Arduino does not have a D/A converter on board. 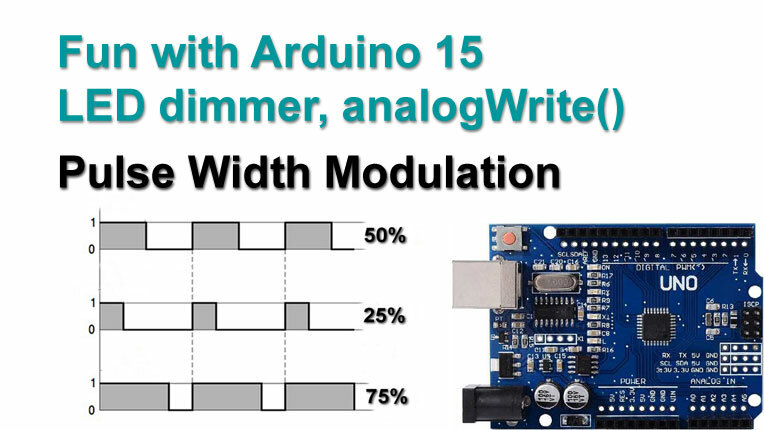 The analogWrite() function uses a technique called Pulse Width Modulation. A digital output switches between HIGH and LOW in a fast pace, whereby the HIGH percentage is proportional to the analog value we wish to send out. If a device that receives the signal is too slow to follow the switching frequency, the result is it 'sees' the average of the on/off times. This also holds for light ... even though LEDs are fast enough to follow the switch frequency, our human eyes + brain are not and we see an average brightness. 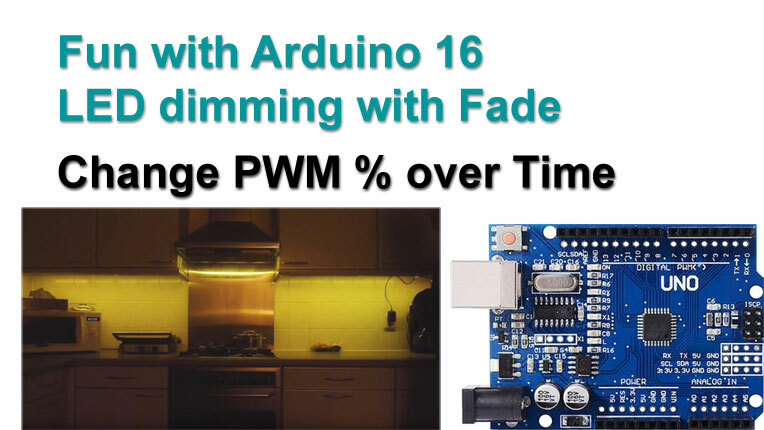 Now that we know how to dim LEDs with analoWrite(), we can go a step further and change the dimming over time to create a gradual fade in or out. This is a nice effect for instance for LED strips mounted under kitchen cabinets, or for LED strip overhead lighting on a model railway layout to simulate a gradual change from night to day. And also for the red/green transition of railway signals along the track a fade gives just that little extra eye candy. 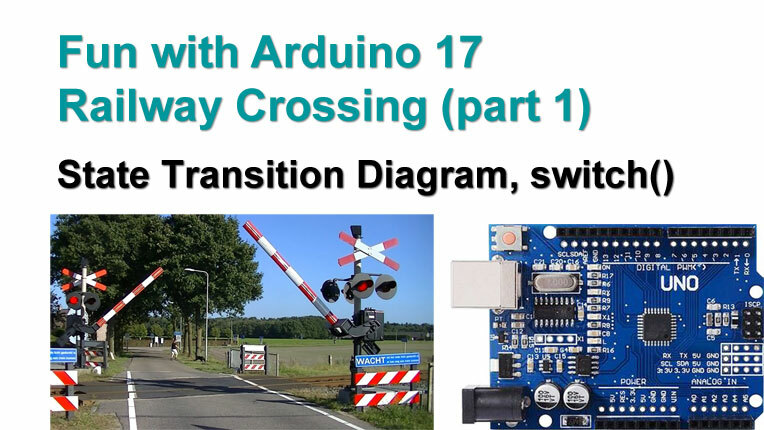 We're at the start of a new Arduino project: an automatic railway crossing. The system comprises several parts: train detection (optical), blinking lights ('blink' with a twist), a moving beam (servo motor). We'll look into a way of specifying these kinds of systems as well as a way to translate the specifications into code, with a stepwise approach that does not put too much strain on our grey cells. 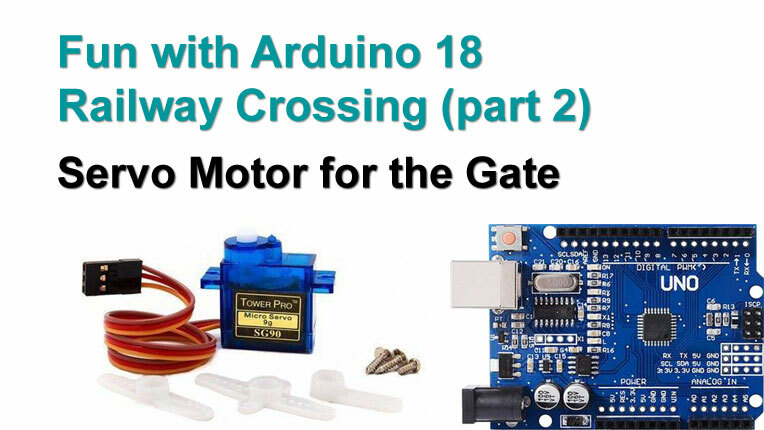 In part 2 of the railway crossing project we are going to connect the servo motor that operates the gate and control it with the Arduino. With the example in the video, the gate beam is mounted directly on the servo. On a layout, the servo motor will probably be mounted under the board, and a metal rod pulls / pushes the beam up and down, through a hole. No matter how it is mounted ... we need to find the correct servo angles. We will write some code with which we can fine tune the servo to find the angles to be used in the code later on. 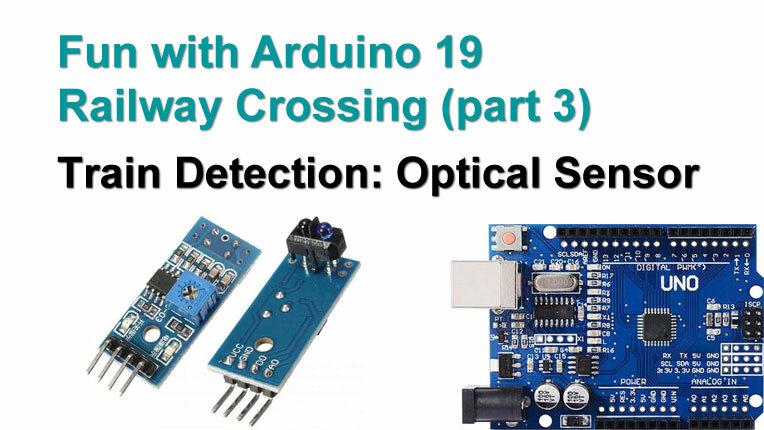 There are several ways to do train detection, like sensing rail current, or a magnet under the train that triggers reed switches along the track, or with an optical sensor. The latter is used in this video, only because I had some TRCT5000's lying around and they were easy to setup for a demo. As soon as we have them working, we have some fun with them by making a train speed measurement device. 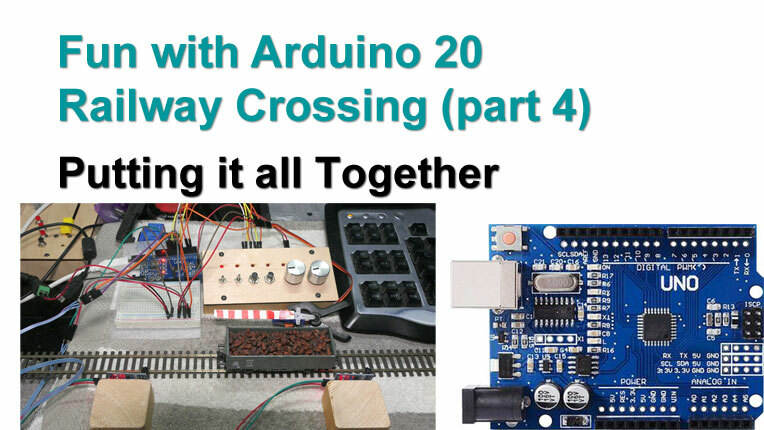 We have seen the separate ingredients for a level crossing in the previous three videos: blinking LEDs, servo to operate the gate, sensors to detect the train ... it is time to put it all together now into one piece of software. We'll use the State Transition Diagram as our starting point and build up the software in 5 easy to follow steps. Neopixels, or addressable LEDs, are color LEDs with a built in chip that takes care of the one wire data communication and of the Pulse Width Modulation for the built in RGB(+W) LEDs. The LEDs are connected via just 3 wires, GND, 5V, Data. The Data line is connected to an Arduino output and we can control the color and brightness of multiple LEDs, via just one output. Wonderful to use in say a village with multiple houses on our model railway layout. The wiring is super simple and the lights in every house switch independently and can each have their own color an brightnes ... just like real. 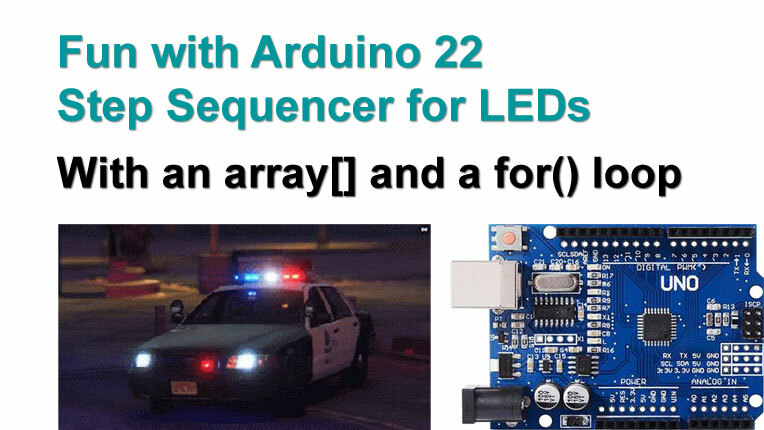 In video 23 we made a step sequencer for addressable LEDs (Neopixel). The beauty of it is that a LED on/off sequence is created in a visual way by editing a series of '1's and '0's: 1,1,1,0,0,0,1,1,0,0,1,0,1,1,0,0. The drawback being that the color of every LED is fixed and also the interval time is fixed. 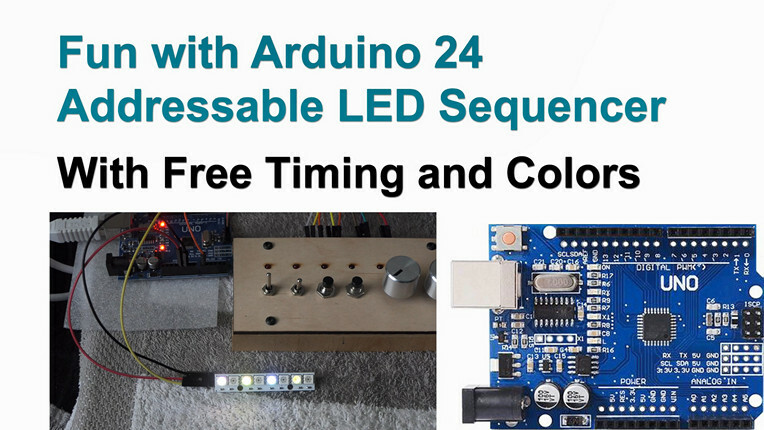 The sequencer in this video has full flexibility, every action step has its own timing and LED color / brightness. A rotary encoder is a digital device, approximately the size of an analog potentiometer. When rotated, it generates 2 pulse signals from which we can deduct the number of rotation steps and the direction of rotation. It also has a push button on board. 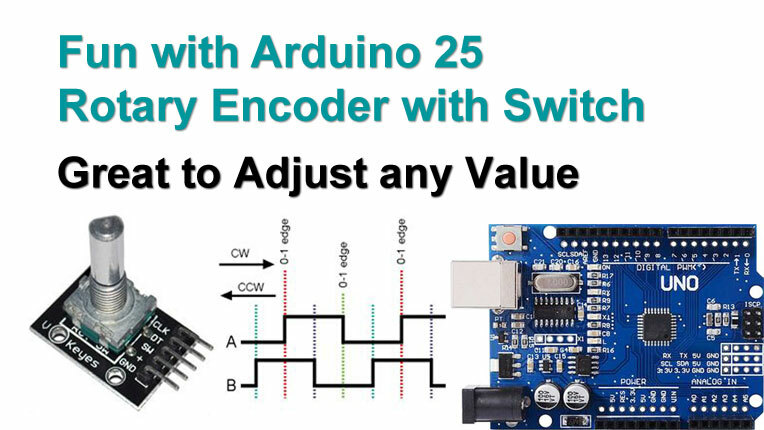 When connected to the Arduino we can read out the encoder and change the value of a variable. The variable can be used for anything we like: control the brightness of a LED(strep), control the angle of a servo motor, and more. In this video we build the software to read out the encoder and switch and control the brightness of a LED (via PWM). In the next video we are going to beuild a servo tune application based on it. 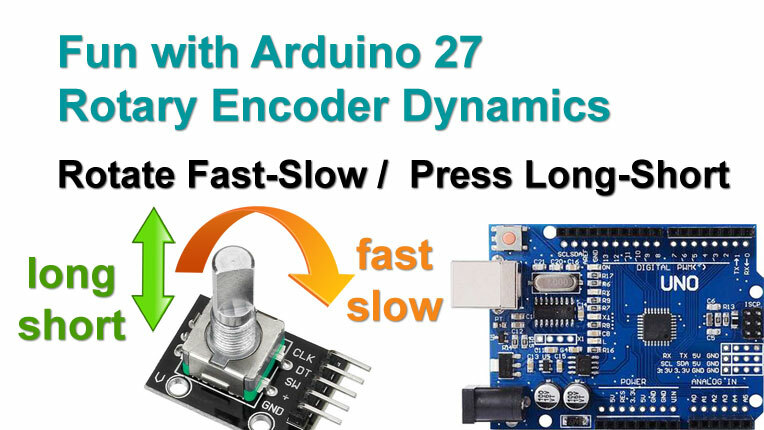 In the previous video we wrote code to read out the pulses and the switch of a rotary encoder. We are now going to use this to tune a servo motor. With every mechanical construction where a servo is used to move something (garage doors, a gate beam, a turnout), the minimum and maximum servo angles need to be found for the construction to operate like we want it to. In this video we are going to build a 'servo tuner' to find those angles. 1: Recognition of slow or fast rotation of the rotary encoder, to be able to increment the motor with small steps or with larger steps. 2: Recognition of short or long press of the button, to be able to move to the min/max angles or to the midpoint of the servo. In this video we will have a look how we can add these functions. 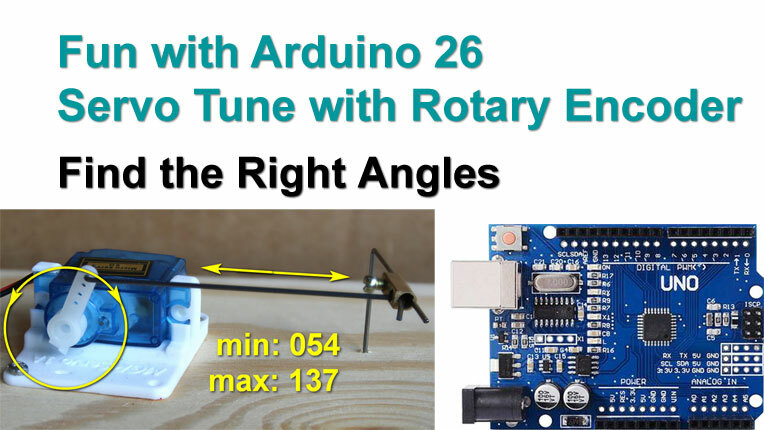 On the blog there's also code available to operate the Servo Tuner with a wire or with push buttons, in case you don't have a rotary encoder available.